Shuttlecock Music Showcase 004 is happening on August 4th, 2017. 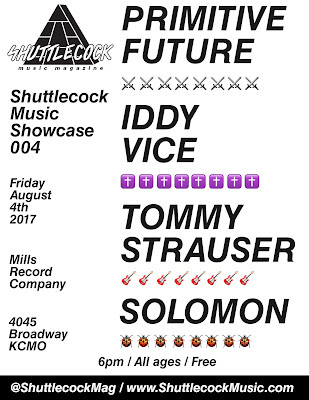 Mills Record Company will be hosting a free all ages show featuring four Kansas City music acts that you won't see together anywhere else. This edition features rappers Solomon and Iddy Vice, death metal band Primitive Future, and singer-songwriter Tommy Strauser. The show will get started around 6pm and be over by 9pm, so get in early and don't miss out. Shuttlecock merchandise will be available if you have an aversion to shopping online. RSVP on the Facebook event and invite all of your best pimps.